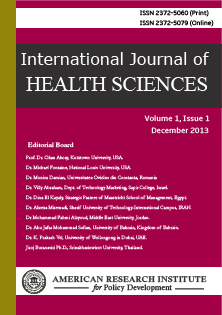 International Journal of Health Sciences is an interdisciplinary international journal that is focused on providing prompt publication of results from original research on all aspects of health. Contributions in the form of research articles and short communications are considered for publication. . It is devoted to the publication of contributions in all fields of experimental and applied researches of health sciences. The editors welcome original contributions that have not been published and are not under consideration elsewhere. Papers accepted for publication are double-blind refereed to ensure academic integrity. The journal strives to provide the most current and best research in the field of health sciences. Each paper published in International Journal of Health Sciences is assigned a DOI®number, which appears beneath the author's affiliation in the published paper. Click HERE to know what is DOI (Digital Object Identifier)? Click HERE to retrieve Digital Object Identifiers (DOIs) for journal articles, books, and chapters. CrossRef, CrossCheck, Cabell's, Ulrich's, Griffith Research Online, Google Scholar, Education.edu, Informatics, HINARI, Universe Digital Library, Standard Periodical Directory, Gale, Open J-Gate, EBSCO, Journal Seek, DRJI, ProQuest, BASE, InfoBase Index, OCLC, IBSS, Academic Journal Databases, Scientific Index. Dr. Qian Sun, Department of Internal Medicine, University of Texas, Medical Branch, USA. Manouchehr (Mitch) Mokhtari, Ph.D., School of Public Health, University of Maryland – College Park, USA. Dr. Irving Smith, Department of Health Education, Coppin State University, USA. Hrvoje Karninčić, PhD., Faculty of Kinesiology, University of Split, Croatia. Dr. Şükran ÖZKAHRAMAN, Faculty of Health Science, Suleyman Demirel University, Turkey. Dr. Chalida Thanattheerakul, Dept. of Pediatric Nursing, Khon Kaen University, Thailand. Dr Huseynova Saadat, Dept. of Neonatology, Azerbaijan Medical University, Azerbaijan. Dr. Emad Adel Mohammad Al-Shdaifat, Faculty of Health Science, Universiti Teknologi MARA, Malaysia. Dr. S. Arulchelvan, Department of Media Sciences, Anna University, India. Dr James Bassey Ejue, Cross River State College of Education, Calabar. Nigeria.